I have started to travel so much lately, and this year it is only going to pick up even more. Packing can sometimes be hard, but I found that if I have luggage that I like it makes it so much easier. I have put together a specific set of bags that I use every time and I really can’t live without any of these bags now! They are all my absolute favorites and I wanted to share them with you! Favorite Carry On Tote – Saint Laurent: I got this tote a few months ago on Like a Bandit so I got it at a discount!! I major scored because Saint Laurent hardly ever is discounted. I love the color and the size is perfect for travel. Seriously my favorite! Carry On Roller Bag – Louis Vuitton: I got this bag for Christmas this year from Drew. I have been wanting it for years and I was so surprised! I never actually decided to buy it for myself but Drew decided to take the plunge since I will be traveling for work a lot this year! Hat Box – CalPak: This is the only way I can travel with hats without ruining them or having them lose their shape. Everyone asks me how I pack hats and this is how!! I check it with my suitcase. Suitcase – CalPak: LOVE this one!! I’ve used a Cal Pak checked bag for years now!! One of my zippers did break and I had to get a new one, but I think that was my fault for overloading it. I have never had an issue with this new one! So cute and functional!! Make Up Bag – Sly Beauty Cosmetics: This bag literally fits everything!! Including my brushes and palettes. The best make-up bag ever! There is a compartment for EVERYTHING!! You know my cousin Ashley?? This is her new makeup bag she designed and I’m telling you it’s life changing. More more unorganized makeup bags!!!! Laptop Case – Senreve: I just love this envelope laptop sleeve. The texture is so perfect and it is my favorite color of course! Jewelry Bag – Truffle: I use this bag for all of my jewelry and it keeps all of it safe. There is plenty of room for my statement earrings which I love! Toiletries Bag – Louis Vuitton: I love this bag for my toiletries such as my skincare products and toothbrush! It is one of my favorites and looks so beautiful displayed on a vanity. It was an investment piece but worth every penny. I use it every day!! Hi Sheri! Yes they do get tossed around so there will be wear and tear. They hold up pretty well and that’s why I love them! 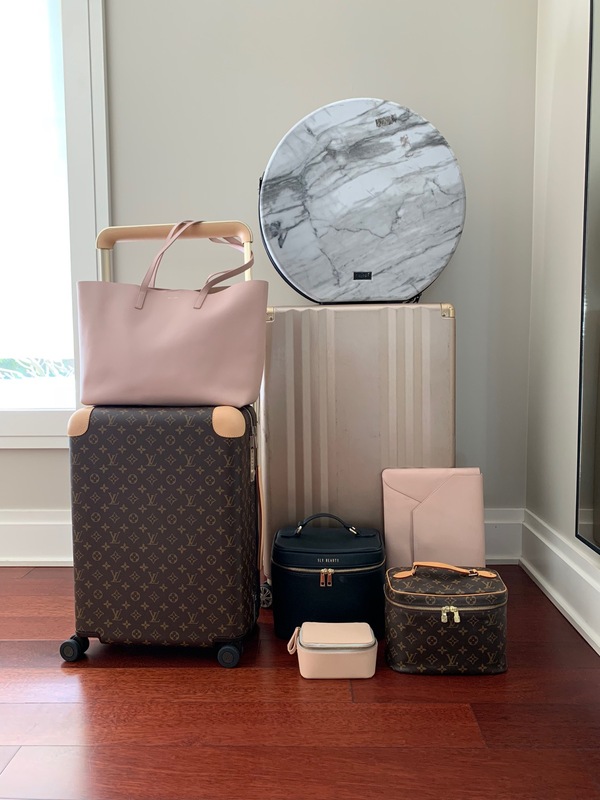 Traveling in style … love ♥️it! Thanks for sharing these. Travel is DEFINITELY easier with a great bag. Everything here is such a travel staple! Love the saint laurent, it is gorgeous and such a wonderful surprise, to get it at a discount. Thanks Maureen! It was an amazing price I couldn’t turn away from! Love it so much! Love all of these!! Esp the Calpak – never knew I needed a hat case! You should check out Stoney Clover Lane – I was just introduced to their stuff and its so cute and perf for traveling!! Thanks for the suggestions Brittany! Love them! Love your blog and am obsessed with your style. What size of the calpak hat box do you have? Packing for my own Hawaii trip next month!